St Augustine, Florida has a total of over 43 miles of white sand beaches -- and many interesting Historical Attractions! -- Then can quickly go back to the original still open Tab Vs having to back up and reload the web page and all lmages on the web page. Add a few cheap vacation days to your Florida Vacation or take a fun mini-Vacation. See the highly discounted Getaway mini-Vacation Lodging Packages on our Timeshare Vacation Promotions page. 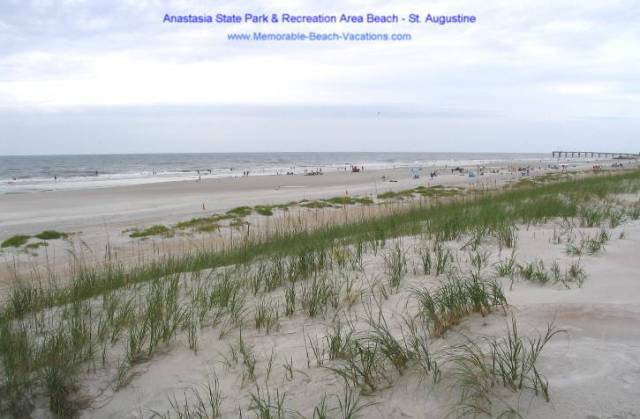 New St Augustine FL Beaches Guide Page. Crescent Beach - South of St Augustine on Anastasia Island. 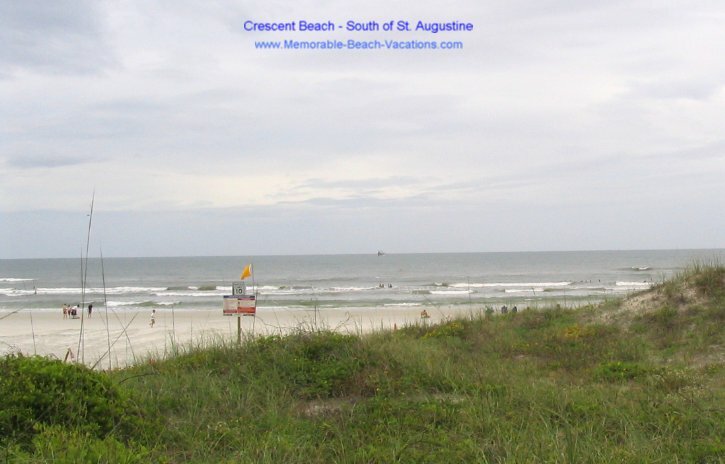 To Saint Augustine Florida Crescent Beach Picture / Screensaver + Info & Tip below. St. Augustine Beach - On Anastasia Island - St Johns County Pier is at north end - St. Augustine Beach is south of Saint Augustine - north of Crescent Beach. Anastasia State Park and Recreation Area. Five miles of beaches - Extensive Facilities. North of St Augustine Beach - SE of Bridge of Lions off of A1A. To St. Augustine FL Anastasia State Park Beach Picture + Info below. Vilano Beach - Just north of St. Augustine over the bridge on A1A. Rentals, Great Oceanfront Restaurants - Vilano Beach fishing pier, more. 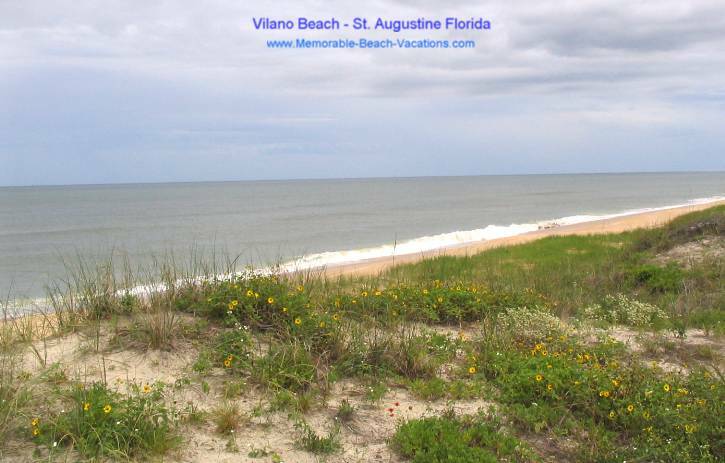 To St. Augustine FL Vilano Beach Picture + Info & Tip below. Are You a Photographer and would like to check out selling your Images Online at a popular Image Site? - See Info at this link - Sell your Photos Online - you set your own image prices. This page has several free St Augustine Florida beaches Wallpapers, Screensavers, and printable St Augustine Florida Attractions Pictures selected from the many on this Memorable-Beach-Vacations.com Web Site. You are welcome to use these copyrighted pictures as long as the domain name text is not altered or removed. Florida St Augustine Attractions Day Trip - to "Must Sees," Tips, and Pictures - including Lightner Museum and historic Alcazar Resort Hotel. The St Augustine Florida Beaches pictures below are set up to easily download into your Windows Desktop or Screensaver by the following steps. If you see other pictures on this web site that you would like to see as downloadable pictures here, please let me know on our Your Top Picks" & Comments Page. All approx 5 x 7 and 6 x 8 Pictures are approximately 50K files and should download almost instantaneously - IF this web page and images have finished loading in your browser. These pictures are free to download and print or use as Wallpapers or Screensavers as long as the Memorable-Beach-Vacations.com or GoUSBeaches.com Domain Name text remains unchanged visibly displayed and readable on the Image. many Size, Framing, and Mount Options + Topic Search. -- Near the bottom below the Pictures on this page. 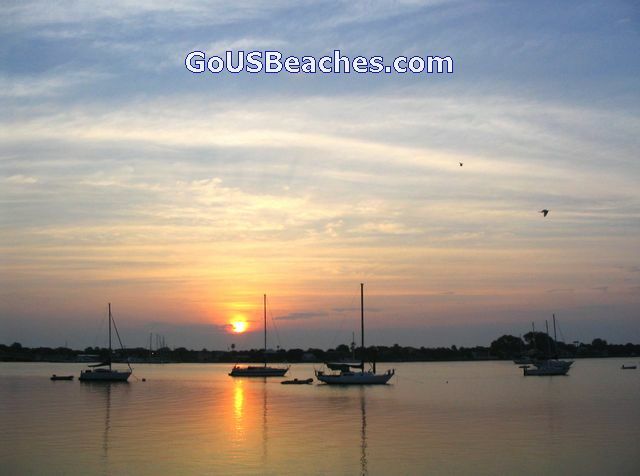 - "Free" Time Share Vacations - - Getaways with a cheap Tour "price"
St Augustine Restaurants. South of St. Augustine down A1A. Tip Wide (deep) sand dunes in St Augustine FL beaches area mean that it is important to rent a "oceanfront" hotel room or vacation timeshare condo on the second floor or higher if you want to to be able to actually SEE the "distant" ocean and St Augustine Beach from your resort condo or room. - both were among our Top Pick St Augustine Florida Restaurants. 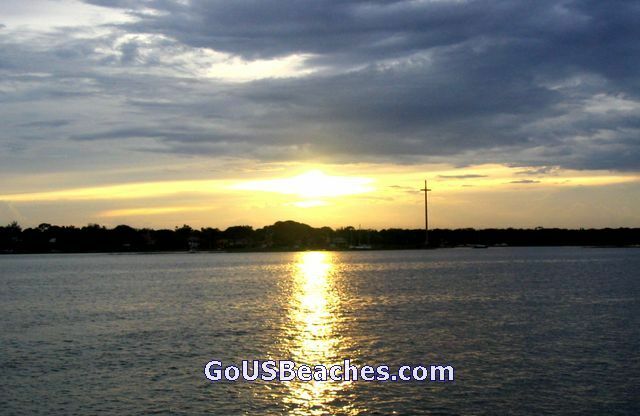 More details + beach location map link on our St. Augustine FL Beaches Info & Tips page. Large Spanish Fort on waterfront, now a National Monument. 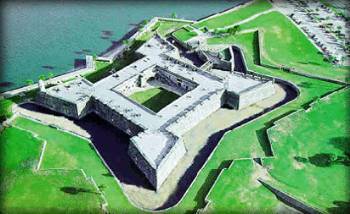 Fort was to guard St Augustine which was the first permanent European settlement in the continental United States. The Castillo de San Marcos National Monument Spanish Fort is a "Must See" St Augustine Florida Beaches area Attraction. - Tip click "In Depth" link for more Info + "Photo Gallery" and other Fort Info Links. To Aerial Satellite Google Local "Hybrid" Map showing Castillo de San Marcos Fort + several other St Augustine Attractions listed that you can easily locate and zoom in on. - single click on map image area and then use your keyboard arrow keys to more "precisely" shift map area view Vs arrows on the map image. Fun & Useful! Historic St. Augustine Lighthouse - 165' tall - 219 steps to the top viewing deck for spectacular views of Old City, Harbor, and St. Augustine Florida Beaches + Atlantic Ocean. 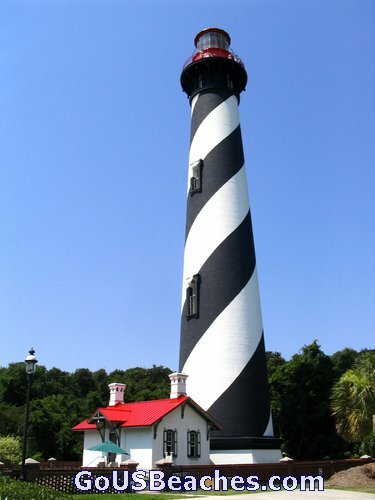 -- Lighthouse is approximately 14 Stories high with Spiral black and white markings. Tip - Don't miss this View! - Worth the Climb. Displays and Benches at landings to stop and view or rest on way up 14 stories of steps. To St Augustine Lighthouse & Museum history & Information. raising when the bridge horn sounds and boats go through. St Augustine Florida Harbor and Old City Skyline - from cruise on 72' sailing Scooner - "Freedom"
- quiet and peaceful - nice views of town and shoreline from water. and opened in 1888. We have found St Augustine to be a very interesting Florida Historic town. 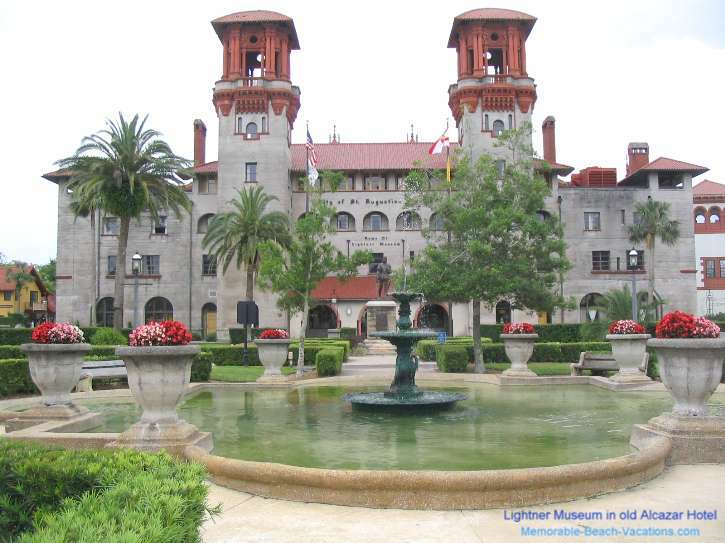 - Alcazar is now home of St Augustine Lightner Museum. Don't miss the Lightner Museum! - Wide variety of great displays + interesting interior of Alcazar Resort Hotel. Tip - Cafe Alcazar Restaurant was one of our Top Pick St Augustine Restaurants for Lunch. Tip - Don't miss guided tour of college and interior of large Historic Hotel / Resort - including the elaborate Ballroom - now used as Dining Room for Flagler College Students. - 208 foot tall stainless steel cross marks the site of the founding of St Augustine, FL and historic Shrine. These pictures are free to download and print or use as St Augustine Florida Beaches Wallpaper or Screensavers as long as the Memorable-Beach-Vacations.com or GoUSBeaches.com Domain Name text is not covered, altered, or removed from the image. Resale of these images or pictures in any form is a violation of our copyright. 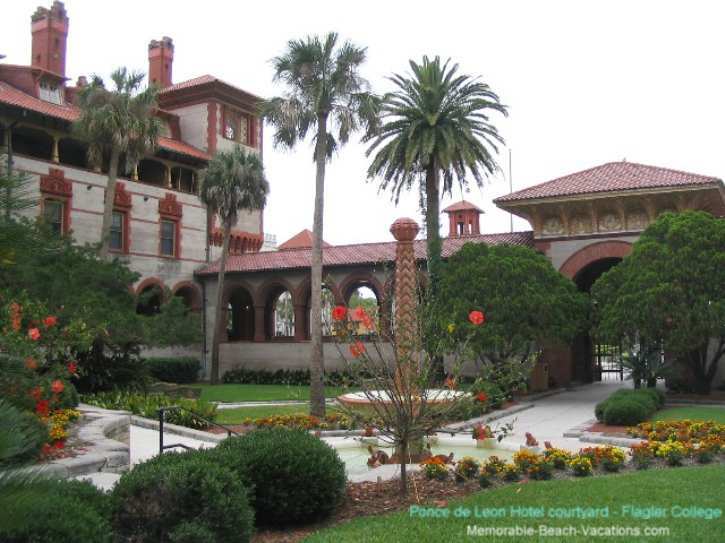 Florida St. Augustine Attractions Day Trip - to "Must Sees," Tips, and Pictures - including Lightner Museum and historic Alcazar Resort Hotel. Click on the Green "B & B/Inns" tab on above page for Info & User Ratings on 35 St Augustine area Bed and Breakfasts & Inns. Florida Vacation Beach Rentals - Reviews Page - Cocoa Beach and Satellite Beach Resort and Timeshare Rental Reviews and Tips. Florida Vacation Beaches Screensaver and Wallpaper Pictures (page 1 of 3 Florida Screensaver Pages) Free Downloads + Printable Pictures - Total of 9 Wallpaper / Screensaver Picture pages on this site + some more on our "Sister" US Vacations Site. We appreciate your suggestions or comments for this St Augustine Florida Beaches page or others on our Gene Seecann Sites Comments Page. 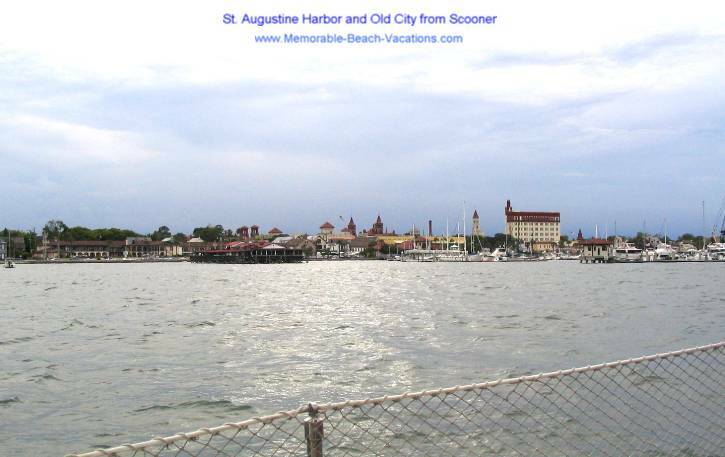 Favorite area St Augustine Florida beaches, area attractions, oceanfront or harbor front restaurants, and places of interest you found interesting or memorable. Attached photos to go with the St Augustine Florida Beaches or other comments are appreciated!!!!! Send your Favorites to us on our Gene Seecann Sites Comments, Suggestions, & Favorites Page - Thanks! We are adding pictures, reviews, and tips almost daily somewhere on this site. We are doing our best to ultimately make this site one of your most Interesting, Fun, and "Picture Enhanced" Florida/Oregon/Virginia Family vacation beach Information Sources. We appreciate your suggestions or comments on our Comments Page above. St Augustine Florida Beaches Screensavers Pictures - printable beach Screensavers & Wallpapers Page - this page - (page 3 of 3 Florida Picture / Screensaver pages) - Now a total of 14 Screensaver / Wallpaper Picture pages on this Memorable-Beach-Vacations.com Site. Looking for Something Specific? Search 2 of our Affordable Vacation Guide Sites.